This game rounds out the survey of the four major levels of professional baseball, from Single A through the majors, because we (I was joined by brother Tom) saw the Jackson Generals (Arizona Diamondbacks affiliate) hosting the Tennessee Smokies (Cubs affiliate) in a Double AA Southern League game. That raises a question I’ve been pondering – when written, is it properly Triple AAA or Triple A? The former seems redundant, but I think that’s the way I’ve always seen it. The AAA game in Louisville seemed of a piece with major league play. The Eastlake Single A teams were young and eager and colt-like. This Double AA game was closer to AAA than to Single A in the bearing of the players and the apparent knowledge of the game. 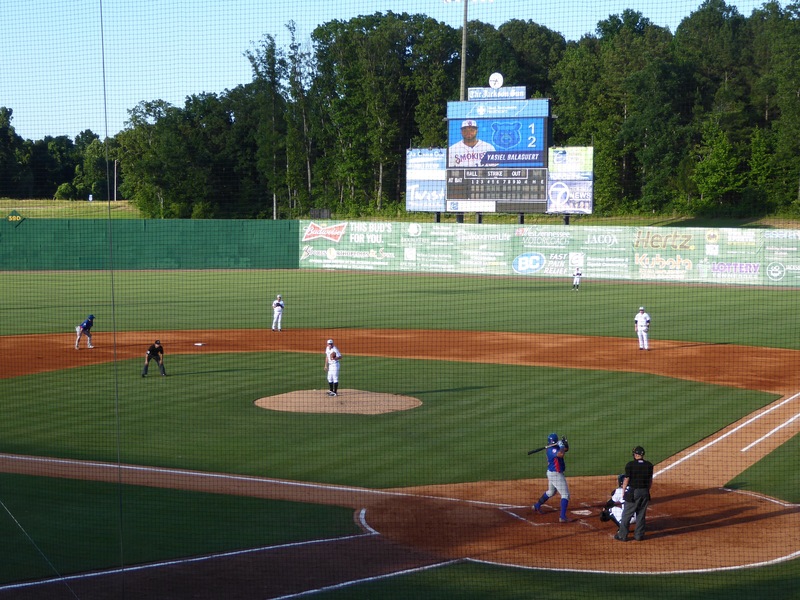 Anyway, the Generals play in The Ballpark at Jackson, a tidy little field right next to I-40 and a part of a large sports complex. 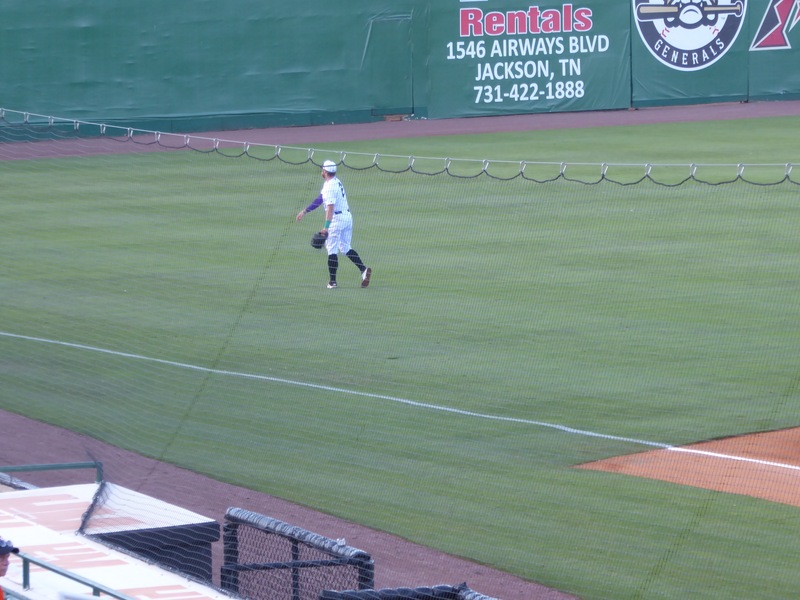 We arrived at 5 for a 6:05 start (have to check out the food, you know) and we were the first fans there! The total attendance for the evening was well under 200. The very first thing we noticed on entering the park was the extremely loud and annoying music. It did not stop. It played as the announcer named the upcoming batter. It played between innings, it played all the time. I couldn’t hear Tom talk and he was sitting right next to me. It made me crazy! Okay, back to the park and baseball. The second thing unusual about the park is that it has the longest screens I’ve ever seen – they extend to about the halfway mark between third and the outfield wall as you can sorta see in this picture. 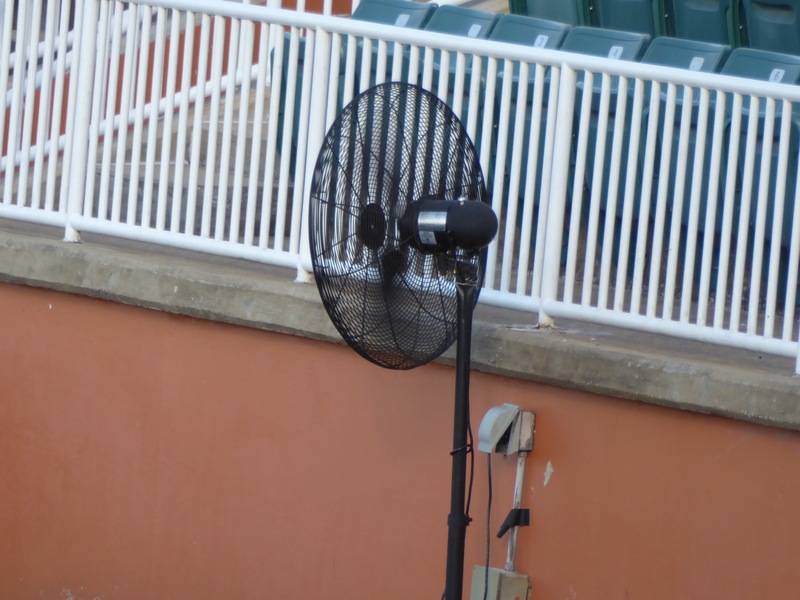 The third thing is fans – no, not the folks in the seats but these fans, which were placed throughout the stands, but none were pointed at us. It was hot and I wish they had been. The fourth thing is the scoreboard, of which there was only one, and it was on the Jumbotron in right field, facing west, so it could not be read with the sun beating on it. That meant we had to pay attention (I guess we could have kept score the old fashioned way, but we weren’t prepared for that). The fifth thing was being carded when I ordered a beer and then having to wear a bracelet (hospital style) for the rest of the evening in case I wanted another beer. Weird. Finally, to the food. Yes I have a picture, though it isn’t very helpful. 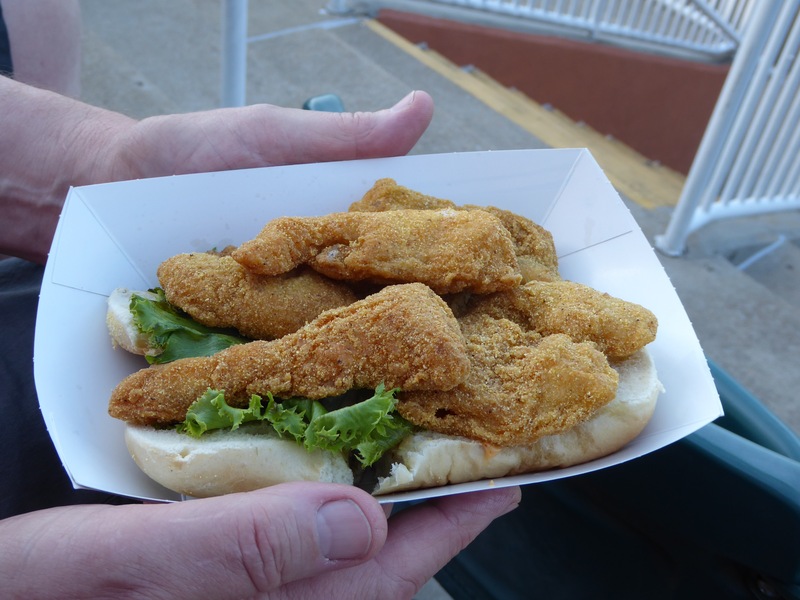 It is a catfish po’ boy, which might have seemed appropriate in Louisiana but a bit out of place in Tennessee. We also had what was claimed to be authentic Tennessee barbecue pulled pork sandwich. The pulled pork wasn’t bad but it needed more sauce, and the po’ boy was also adequate but probably not memorable. Actually, that wasn’t really the last thing. The last and best thing, never seen anywhere else in the professional baseball world – wait for it – . . . HAMMOCKS!!! Oh, and the game wasn’t half bad either. The lead went back and forth until the Generals got their lead off man on in the bottom of the ninth, he was balked to second and scored on a walk off double. So on the whole, a very successful evening. 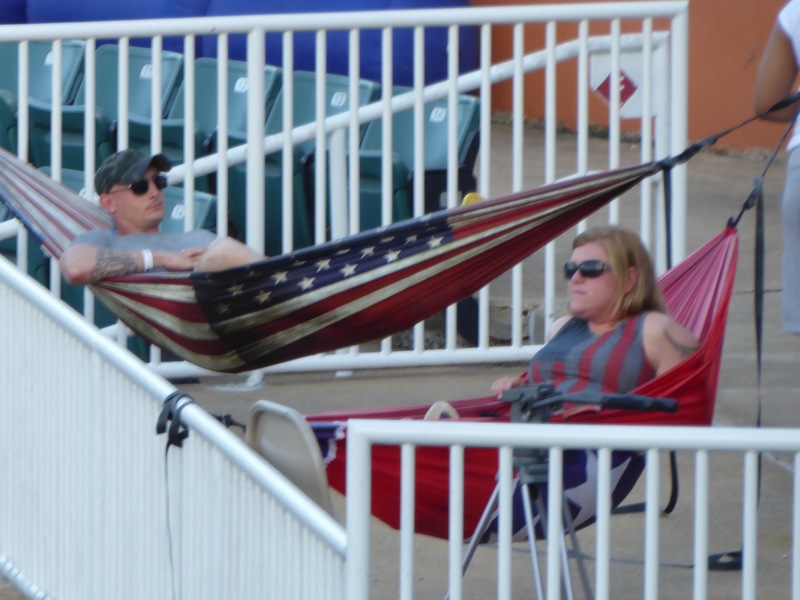 With the Venn diagram of weird things in this park, including catfish and hammocks, it feels like this may rank very high on the Americana chart. I notice the park has no sponsorship name yet and I bet that could be had for a relative song. As part of your portfolio, would you consider investing in Bob’s Ballpark or Newell’s Nest? Some travel expenses could henceforth be written off, you could fix the electric fans, the jumbotron and the hospital bracelets, you could probably party with other AA owners across the country, you’d need to be at spring training every year (more expenses written off) and maybe you could even have a small say in improving the Hall. And introduce new mascot-like characters to draw the kids: Quincydence and the cyber E-lion. Another great report. Thank you for Bobbin’.